Simon Shaw began his rugby career for Bristol at only 17, having moved to England with his family from Nairobi in Kenya. His early years in the sport saw him gain honours for England at U-18, U-19 Colts, Students and U-21s before he was called up to the full squad for the 1995 World Cup. Shaw was unable to make the trip to South Africa due to a ruptured knee ligament, the beginning of a worrying trend of injuries at inopportune times in his career. His debut did finally come in the 1996 against Italy, and he subsequently started all of England's 1997 Six Nations matches. He was selected later that year by Ian McGeechan for the Lions tour to South Africa, although he did not feature in the test side. Shaw was by this time playing his club rugby with Wasps, having made the switch from Bristol in 1997 after seven years in the West Country. Shaw's international career would stall following his involvement in the 1998 England "Tour to Hell" in New Zealand and Australia and he missed out on selection for the 1999 World Cup. He was recalled to the England squad in 2000 as cover for the injured Martin Johnson, and was again used as a replacement in England's summer tour win over South Africa in Bloemfontein. He continued to hold down an England place through the 2001 summer tour of North America, scoring his first international try against Canada. Outstanding form at club level saw Shaw retained by England throughout 2002 and 2003, but despite playing in the World Cup warm up games he was left out of the original party. Following an injury to Danny Grewcock, Shaw was flown out to join up with the squad. He returned home with a winner's medal despite having not played a game. Shaw had a mixed 2003-04 season as he was awarded the Premiership Player of the Year award but became only the third England player to be sent off after kneeing All Black Keith Robinson during the second test in Auckland. While Shaw seemed to be held back by indifference to his talent at international level he was reaping the rewards of Wasps' growth into a world class side. Since joining them in 1997 he has won the Premiership on four occasions, two Heineken Cups and the Pilkington Cup. Shaw was a late addition to the 2005 Lions tour of New Zealand after an injury to Irish lock Malcolm O'Kelly. He was an ever present from the bench in the 2006 Six Nations and despite missing the 2007 tournament made the trip to France for the World Cup in October that year. His partnership with Steve Borthwick saw him start 14 of 15 matches for England before the 2008 autumn internationals, but he has suffered under the management of Martin Johnson. He made one appearance during the autumn series, as a replacement against South Africa, and would have to wait until March before being selected for his next cap against France at Twickenham. Shaw was selected for the 2009 Lions tour of South Africa, forcing his way in to the side for the second Test against the Springboks in Pretoria. Following an emotional loss Shaw maintained his place for the third Test victory, but was yellow-carded and subsequently handed a two-week ban for striking following an incident with Springbok scrum-half Fourie du Preez. 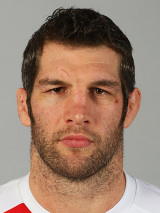 A foot injury, suffered in the third Test victory over the Springboks, limited his contribution to the early stages of Wasps' 2009-10 Premiership campaign but he did enough to warrant a recall to the England side for their last international of the year against New Zealand and retained his place in the squad for the 2010 Six Nations. And Shaw's resilience showed no signs of abating after been named in Johnson's 30-man squad for the 2011 World Cup. Shaw looked set to return to Wasps following the World Cup but he asked to be released from their agreement and on November 14 he was unveiled by big-spending Toulon as their 'injury joker' for the rest of the 2011-12 season.